Let me start by saying how much I love and adore my network of educators! I’ve started feeling a little nervous about the upcoming school year. I always do, but this year is different as I’ll be in a new school for the first time in a long time. There’s a new faculty for me to get to know and build relationships with and I want to start things off by setting a positive tone. Thinking a lot about how I want to introduce myself as the new librarian so the teachers will really get me and what all I’m about, I reached out to my PLN for some help. Teachers (especially those that have worked with me): What are the most helpful and meaningful things that a school librarian can do to support you? Librarians: What would you want teachers new to working with you to know that you can do to support them? I sorted and tallied responses to ultimately refine and combine ideas into this list. It will be very exciting to use this graphic to introduce myself and what I can do for my new teachers. 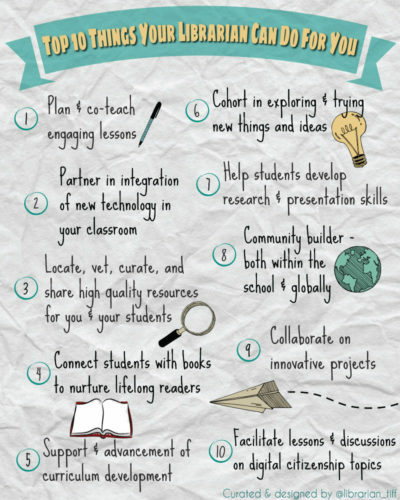 What’s even more exciting is that I get to share this graphic with my awesome PLN! Please feel free to use and share this in any way that you see fit. Even if you are in a school where you have established relationships, it’s always great to start off the new school year reminding your teachers the many ways that you are a resource to them. If you’re interested in downloading the high resolution file of this image, you can download it from Flickr. I hope this can be something for you to take back to school and use to kick off an awesome school year! I am also starting a new position as librarian at my school. I’ve been teaching there for 15 years, but I was looking for a way that I could show the teachers what all I hope to accomplish with them and this is perfect. Thank you for sharing your information. Have a good school year! I am so feeling your pain! Starting new library position, following in the footsteps of an AWESOME librarian. Feeling very scared, anxious that I won’t live up to expectations. ACK! This is my new favorite website! I’m beginning as a middle school librarian this year, and I’m going to need lots of help and suggestions! Thanks for sharing all of these awesome ideas, tips, and strategies! Blessings to all! Thank you, this is great! I am starting at a new school and this will certainly come in handy ! Thank you for sharing. I am starting this year as a middle school librarian after being in elementary for ten years. I feel the same anxiousness. Looking forward to sharing ideas! This is perfect! Just what I was looking for! Thanks!!!! Love this infographic! I will be sharing with my colleagues as we start the school year. Thank you! I saw this on the LM_Net listserv and loved it. What did tool did you use to make it? The collective wisdom built into this Top Ten is evident. Thanks for sharing it and making a difference for another librarian starting up in a new school! What tool did you use to make this? I used PicMonkey with a tiny bit of finishing in Photoshop.